Algorithm to select a single, random combination of values? Say I have y distinct values and I want to select x of them at random. What's an efficient algorithm for doing this? I could just call rand() x times, but the performance would be poor if x, y were large. 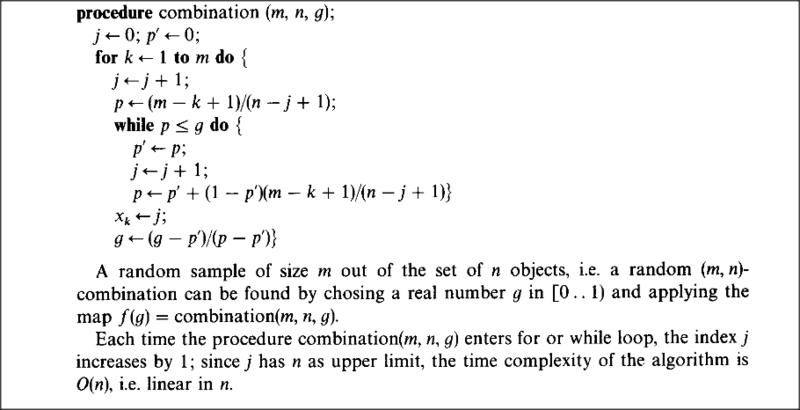 Note that combinations are needed here: each value should have the same probability to be selected but their order in the result is not important. Sure, any algorithm generating permutations would qualify, but I wonder if it's possible to do this more efficiently without the random order requirement. How do you efficiently generate a list of K non-repeating integers between 0 and an upper bound N covers this case for permutations. Robert Floyd invented a sampling algorithm for just such situations. It's generally superior to shuffling then grabbing the first x elements since it doesn't require O(y) storage. As originally written it assumes values from 1..N, but it's trivial to produce 0..N and/or use non-contiguous values by simply treating the values it produces as subscripts into a vector/array/whatever. In pseuocode, the algorithm runs like this (stealing from Jon Bentley's Programming Pearls column "A sample of Brilliance"). That last bit (inserting J if T is already in S) is the tricky part. The bottom line is that it assures the correct mathematical probability of inserting J so that it produces unbiased results. It's O(x)1 and O(1) with regard to y, O(x) storage. Note that, in accordance with the combinations tag in the question, the algorithm only guarantees equal probability of each element occuring in the result, not of their relative order in it. Assuming that you want the order to be random too (or don't mind it being random), I would just use a truncated Fisher-Yates shuffle. Start the shuffle algorithm, but stop once you have selected the first x values, instead of "randomly selecting" all y of them. select an element at random, and swap it with the element at the end of the array. Recurse (or more likely iterate) on the remainder of the array, excluding the last element. Steps after the first do not modify the last element of the array. Steps after the first two don't affect the last two elements. Steps after the first x don't affect the last x elements. So at that point you can stop - the top of the array contains uniformly randomly selected data. The bottom of the array contains somewhat randomized elements, but the permutation you get of them is not uniformly distributed. Of course this means you've trashed the input array - if this means you'd need to take a copy of it before starting, and x is small compared with y, then copying the whole array is not very efficient. Do note though that if all you're going to use it for in future is further selections, then the fact that it's in somewhat-random order doesn't matter, you can just use it again. If you're doing the selection multiple times, therefore, you may be able to do only one copy at the start, and amortise the cost. If you really only need to generate combinations - where the order of elements does not matter - you may use combinadics as they are implemented e.g. here by James McCaffrey. Contrast this with k-permutations, where the order of elements does matter. In the first case (1,2,3), (1,3,2), (2,1,3), (2,3,1), (3,1,2), (3,2,1) are considered the same - in the latter, they are considered distinct, though they contain the same elements. In case you need combinations, you may really only need to generate one random number (albeit it can be a bit large) - that can be used directly to find the m th combination. Since this random number represents the index of a particular combination, it follows that your random number should be between 0 and C(n,k). Calculating combinadics might take some time as well. The general idea is to do a Fisher-Yates shuffle and memorize the transpositions in the permutation. It was not published anywhere nor has it received any peer-review whatsoever. I believe it is a curiosity rather than having some practical value. Nonetheless I am very open to criticism and would generally like to know if you find anything wrong with it - please consider this (and adding a comment before downvoting). A little suggestion: if x >> y/2, it's probably better to select at random y - x elements, then choose the complementary set. If, for example, you have 2^64 distinct values, you can use a symmetric key algorithm (with a 64 bits block) to quickly reshuffle all combinations. (for example Blowfish). This is not random in the pure sense but can be useful for your purpose. If you want to work with arbitrary # of distinct values following cryptographic techniques you can but it's more complex. The trick is to use a variation of shuffle or in other words a partial shuffle. Here is a simple way to do it which is only inefficient if Y is much larger than X. Basically, copy the first X of your distinct values to your output array, and then for each remaining value, randomly decide whether or not to include that value. The random number is further used to choose an element of our (mutable) output array to replace. What's the fastest way to generate a random sequence from a list of data? Algorithm to generate 1000 distinct integers in the range [0,8000]? Randomly select subset of all possible combinations in Matlab?